With all of the major upfront presentations happening next week in New York, the networks have been solidifying their lineups, and cleaning house, over the past few days. 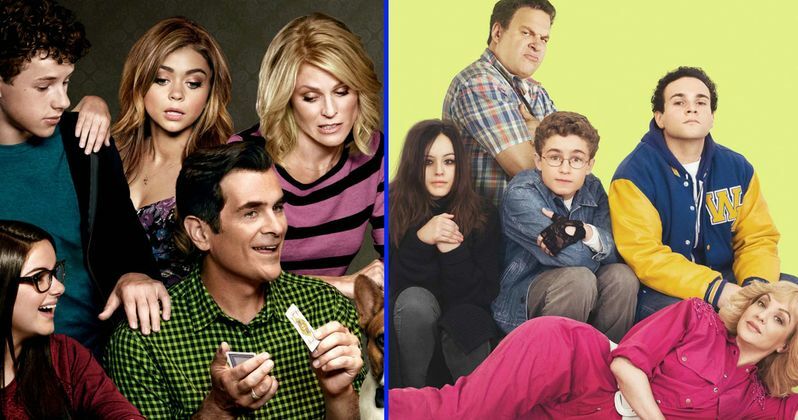 ABC is no exception, with the network doubling down on two of their hit Wednesday night comedy shows, issuing two-season renewals for both The Goldbergs and Modern Family. The Goldbergs renewal will bring the show through Season 6, while the Modern Family renewal extends the show's run through Season 10. The Hollywood Reporter reveals that the renewal comes after "fierce negotiations" between ABC and Sony Pictures Television, which produces the comedy series, in an effort to bring down the show's licensing fee. ABC fully finances the show's production, which comes at a price tag of $3.1 million per episode. This report reveals that this season in particular, networks are trying to own as much of their shows as possible, due to dwindling viewership and financial returns, along with a soft ad market. The Goldbergs follows the trials and tribulations of the title family in the 1980s, with the show often featuring a number of movie parodies, such as their Misery parody which served as their Halloween episode. We reported in November that ABC was eyeing a Goldbergs spin-off set in the 1990s, which will focus on Goldbergs gym teacher Coach Melor (Bryan Callen), who becomes a father figure to the school secretary's three rambunctious children. Tim Meadows' guidance counselor character Mr. Glascott is also said to be involved in the spin-off. While a series order hasn't been handed out yet, this project is still in consideration at ABC, and it may very well be announced as part of the network's lineup during their upfront presentations next week. The Goldbergs has risen to be one of the network's top comedy performers, averaging 7.9 million viewers per episode and a 2.5 rating in 18-49 demo, the second highest numbers on the network behind Modern Family. As for Modern Family, the renewal also comes with a rich new deal for the ensemble cast, which brings the show's cost up to a whopping $5 million per episode. While no specific figures about the negotiations were released, Sofia Vergara (Gloria), Julie Bowen (Claire), Ty Burrell (Phil), Eric Stonestreet (Cameron), Jessie Tyler Ferguson (Mitchell) and Ed O'Neill (Jay), Rico Rodriguez (Manny), Nolan Gould (Luke), Sarah Hyland (Haley) and Ariel Winter (Alex) all received raises. Here's what co-creator/co-showrunner Steve Levitan said in a statement about the renewal. "We are beyond thrilled that we get to spend more time with these characters, these amazing actors, our ridiculously talented writers and our incredible crew, all of whom are like family to us. And the good kind of family, not the kind that argues with you all the time." The renewal is for 44 episodes in total, 22 per season, but it has not yet been confirmed if Season 10 will be the final season for Modern Family. Much like The Goldbergs, ABC was once considering a Modern Family spin-off that centered on Rob Riggle's character Gil Thorpe, Phil Dunphy's realtor nemesis, but that never moved forward. Ironically, before The Goldbergs was picked up, series star Wendi McClendon-Covey guest-starred on Modern Family as one half of a lesbian couple who served as rivals to the gay couple of Mitch and Cameron. Modern Family's Season 8 ratings are the second highest for a half-hour sitcom in all of television, just behind The Big Bang Theory, averaging 11 million viewers an episode and a 3.8 rating in 18-49 demo. Take a look at the tweets from both hit sitcoms, announcing the renewals.